A visual riddle I learned as a kid. Input text: a 20 foot tall flat upside down black pyramid. a 10 foot tall and 50 foot wide flat blue wall is in front of and -23 feet right of the pyramid. a 5 foot tall flat black pyramid is -.1 foot above and -10 foot right of the wall. camera light is black. sun is white. ambient light is linen. sky is baby blue. 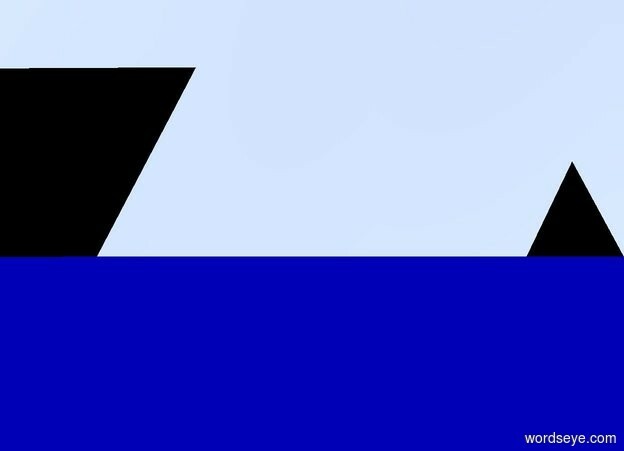 A sailboat meeting an ocean liner? Capital A hiding behind a blue wall?